Discover 3 ways that German learning games and video games can help you learn and master German faster, retain more, and enhance your language skills. Create Your Free Lifetime Account and Start Learning the whole German Language from the Beginning! Can You Learn German Using Games? Yes, German learning games and even video games can help you learn and master German faster and improve overall comprehension. Research studies have concluded that video games enhance traditional learning methods and make mastering a new language like German fun and exciting. Without the firm foundation in grammar and vocabulary provided by conventional learning programs, however, you will not be able to learn German with games alone. But when you combine the solid educational foundation like you’ll get at GermanPod101 with the benefits of German learning games, you learn faster and retain more than with traditional learning alone. When combined with a solid foundation in vocabulary and grammar, video games help students improve reading, comprehension, and even speaking skills. The results are even more pronounced in struggling students. According to a recent national survey, more than 78% of teachers noted that learning games, even video games, were effective in helping struggling students compensate for learning gaps in their traditional studies. So how do German learning games, or even video games, help students improve their linguistic skills and cognitive development? The key is practice, practice, and more practice! Learning games and video games naturally require the integration of several linguistic skills including reading, listening, speaking, and even writing in some games. And by removing the fear of making mistakes so common in students in traditional classroom settings, students are free to practice the language and further develop their linguistic and cognitive abilities in the process. Do a compliment in German? Break-Up Lines? Our Vocabulary Lists are Made for You! Students naturally learn faster and comprehend more when they are forced to use the information often and in real-world situations, even the fake ones created by German learning games and video games. Essentially, this is immersion-based learning or contextual learning very similar to what one experiences when living abroad and being forced to interact with people in another language. 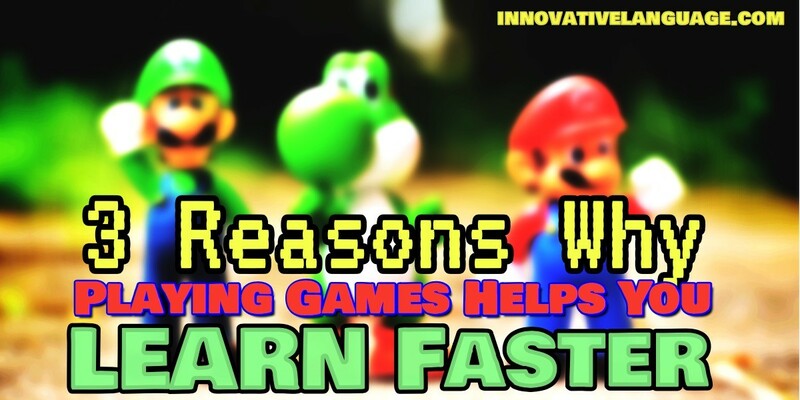 So by providing both context and constant feedback, video games allow students to actually use the knowledge they gain in classrooms or conventional study to learn and master German or any new language faster. Homework, quizzes, tests, and even in-class assignments can cause a great deal of stress and anxiety in students, particularly those who may be struggling to keep up. This stress and anxiety can actually derail a student’s progress and cause them to feel isolated from their more successful peers. But video games and even most learning games are the great equalizer because they help alleviate stress, increase social engagement, and yes, even help students have fun while learning German or any new language. Scientists have indeed discovered that not only can you learn German or any new language faster thanks to video games, they can also provide a wide range of potential health benefits as well. However, learning languages through video games alone is not really a feasible alternative to progressive, structured learning like you find in classrooms or programs like GermanPod101. Get Your FREE PDF eBook to Start Learning One of our 34 Languages! Learning Games Not Designed to Provide a Foundation in Grammar or Vocabulary: Without the foundation provided by structured German learning (classroom or online), video games or even language learning games only teach specific phrases and concepts. Now within the context of the video game, these phrases and concepts make sense but most would have little practical value in the real world. Lessons Are Not Structured or Progressive in Nature: Structured learning requires students to be provided with basic building blocks of knowledge (like grammar or vocab lessons) that are then expanded upon in a progressive fashion until mastery. Video games and even many language learning games really only quiz and reinforce what students already know instead of providing structured lessons that can be built upon for future learning. German learning games and even video games are great supplemental tools to help students learn and master a language faster. Scientific studies and recent research reveal that video games can help contextualize formal lessons from structured learning, enhance linguistic skills, alleviate stress, and even provide a wide range of potential health benefits. However, learning languages through video games (even learning games) has limitations and is no substitute for structured lessons that provide a firm foundation in vocabulary and grammar. GermanPod101 is the world’s most advanced online learning system with more than 2500+ HD video lessons created by real German instructors. 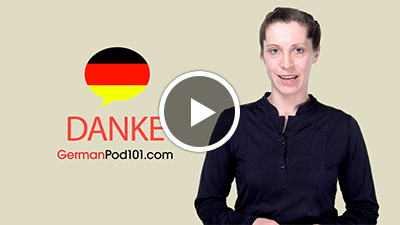 With more than 500 million lesson downloads and 10,000’s of success stories, GermanPod101 can provide you with a world-class foundation in vocabulary and grammar. Combined with German learning games, our cutting edge online language system can propel you to mastering the language faster, more easily, and at far less expense than traditional classroom instruction. Learn 4 honest reasons you need German slang words and why they are so vital to truly learning and mastering the language. Teachers may normally cringe at the thought of their students learning German slang words. After all, slang words and phrases are typically defined as being grammatically incorrect. So why would your teacher want you to spend time learning the “wrong way” to speak German? Here are 4 of the top reasons why you should study slang words and expressions when learning German or any new language. If you are going to study a foreign language and plan to use it to speak with native speakers, then you have to learn slang words and expressions. Otherwise, just using formal expressions and grammar may alienate you from native speakers and make it more difficult to establish a real connection. So it is best to at least learn some common slang words and expressions if you’re planning to meet or speak socially with someone. If you turn on any popular German TV show, listen to any song, or watch any movie, you are quickly going to see the value of learning German slang phrases. Just like everyday conversations between native speakers, German culture is filled with slang phrases and expressions. Without at least some knowledge of the more common slang phrases, popular culture and most conversations will be very confusing and potentially alienating. Want to Amaze Native Speaker? Be a Good Lover? Our Vocabulary Lists are Made for You! Only relying on formal grammar and vocabulary is very limiting, especially in social situations. Just like in your native language, using the appropriate German slang words can help you express a broader range of emotions, thoughts, and feelings. We’ve all met foreigners who technically used formal language perfectly but still sounded odd and well….foreign. But when you use the right slang words and expressions, you will sound more natural and like a true native speaker. If you notice, even most politicians include a sprinkling of slang expressions and words throughout their speeches to help them sound more natural and to better connect with the audience. Learning German slang words can indeed help you sound more natural, better understand the people and culture, and make integration much easier. However, there is a dark side: using the wrong slang expressions can also make you look foolish, uneducated, and potentially disrespectful. But how do you know which slang words or phrases to use and when? The truth is that you can’t learn the most modern and appropriate slang words in textbooks or formal classroom settings. By the time the information gets incorporated into a formal curriculum, it’s already outdated and no longer in use by actual German people. And while you can learn current slang expressions from German TV shows, movies, songs, and games, you may not understand the context. If that happens, you may use the right German slang words but in the wrong situation and still look like a fool or possibly even offend someone. Step out from the darkness and Get Your FREE PDF eBook to Start Learning German! So where can you learn current slang expressions and the right context in which to use them? 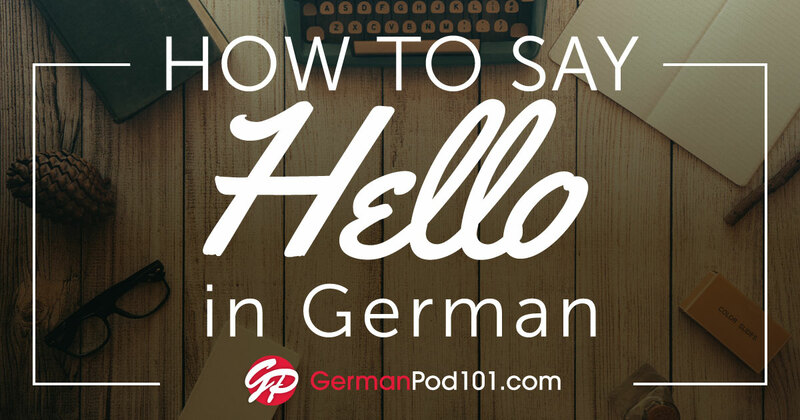 At GermanPod101, native speaking instructors create audio and video lessons that can include slang expressions and words. Our instructors provide context and examples for all the German slang words used in any lesson to make sure students understand the right time and place to use them. German slang words and expressions may be grammatically incorrect but they are vital to truly understanding and immersing yourself in the culture. In fact, it will be very difficult to fully understand any movie, TV show, song, game, or even 1-on-1 conversation without knowing a few of the more common slang expressions. However, it is important to learn the proper context and use of even popular slang expressions or you may come across as confusing, disrespectful, or uneducated. 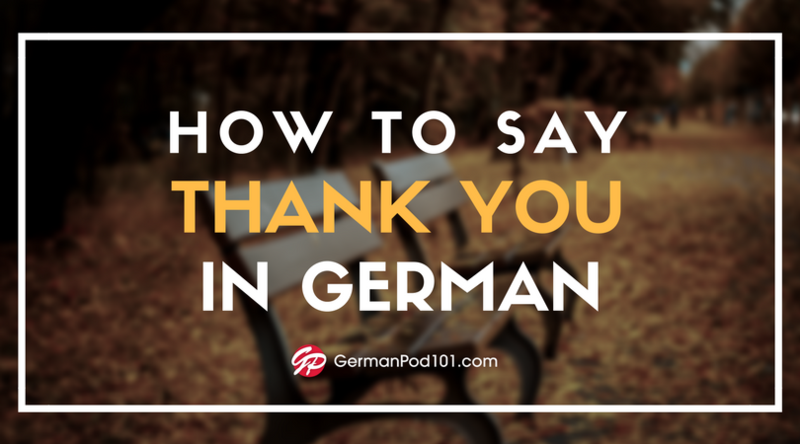 At GermanPod101, you’ll learn how to use slang phrases and words to draw the right attention and avoid these problems. Don’t forget to sign up for a Free Lifetime Account on GermanPod101.com to access tons of FREE lessons and features to become fluent in German! Zombies are coming, and they speak German! Do you have what it takes to survive? No? How lucky you are, we have exactly what you need. Here is the Top 20 Words and Phrases you need to survive this Apocalypse! Click here to listen how to pronounce those phrases! What’s your favorite zombie movie? Click here to access this lesson for free! -Wenn es einen Zombie-Angriff geben würde, wohin würdest du fliehen? If there was a zombie attack, where would you go? Start Learning German Right Now! Want to amaze zombies? Become their friends? Learn German with our vocabulary lists! More sample sentences, vocabulary, audio and video lessons when you sign up for free at GermanPod101.com. Introducing Our Brand New Dashboard! Guess what? Your language learning goals just got a little easier! Your progress is now tracked right, smack in the middle of the page to keep you motivated and organized. A new, sleek and easy to navigate design allows you to worry less about where to click and more on learning German! An enlarged profile picture that gives your dashboard a unique and more personal feel. A new layout for the “Latest News” feed to keep you informed on all of the most recent GermanPod101.com updates. Bigger buttons to make it easier on the eyes. Locate your all of your lessons and materials faster than ever. Stay tuned, as more updates are being rolled out later in the month! P.S. Get Access To Our My Teacher Tool For Extra Help! As you may have noticed, on the left side of your dashboard is our My Teacher feature. This tool allows you to have 1-on-1 interaction with your very own personal teacher! This is only available to our Premium Plus subscribers, so be sure to upgrade if you want to take your studies to the next level! Click Here To Sign Up For Premium Plus Now! 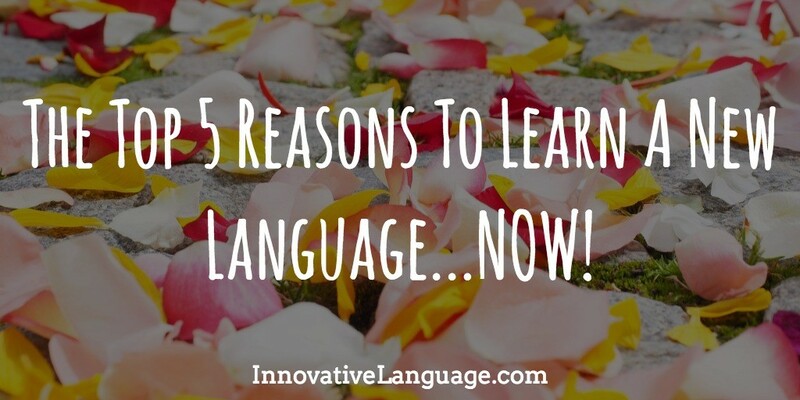 The Top 5 Reasons To Learn A New Language… NOW! Are you currently debating whether or not to learn German? You aren’t alone. Learning a new language requires a huge investment of time, and often money as well. That’s why so many people are hesitant to spend the amount of effort required to become fluent in another language. However, learning a new language can be one of the most rewarding experiences in life and there are a number of reasons why you should start studying one… and start studying now! Click Here And Start Learning German With A FREE Account! That’s right. It’s not rocket science. A new language can open up many new doors. You’re able to work in countries other than your own, leading to a world of new opportunities. It can also qualify you for many new jobs in your home country as well! There are tons of employers who look to hire multilingual professionals every year! This may be one of the most rewarding parts of learning a new language. You’ll be able to get to know speakers of other languages on a more personal level. Meeting people from around the world is one of the main reasons people begin to study a language, so don’t ever feel like making new friends isn’t a good enough reason to start studying! Whether you decide to live abroad, or you’re just taking a vacation, knowing the local language will give you the ability to better understand the people and culture of a different country. This can open your eyes to not only their country, but your country as well! You can understand how people see your home from their perspective. Stop Procrastinating And Start Learning! Sign Up For FREE Here! Good news! Studying a new language actually comes with health benefits! Studying a new language helps keep your brain sharp! By studying every day, you’re helping your mind fight off the old age and stay fresh! When it comes down to it, learning a new language is just plain fun! There’s always something new to learn and the rewards are endless! Whether your goal is to meet new people or to get a job in a new country, language learning is something that is actually enjoyable! Start Learning German For Free By Clicking Here! There are millions of reasons to learn a new language, so what are you waiting for? Dive in head first and start studying with us! You can sign up for a FREE lifetime account and start achieving your German language goals today! In this Beginner lesson, you’ll learn German words about Drinks. How would you react if someone put you on the spot with a German question? That’s exactly what happens to Alisa in this series…but it’s for a good cause: to help you learn German! In each lesson of this fun and lighthearted video series, you’ll learn five German words and phrases, plus sample sentences. Join us for German Words of the Week with Alisa for Beginners at GermanPod101.com! Click here to learn more German words about drinks chosen by Alisa! The Anniversary Starts Now! 53% OFF Premium. The Biggest German Discount of 2015! Your Dream of Learning German Will Never Be More Affordable Than During Our 10-Year Anniversary Countdown! MASSIVE 53% OFF 24-Month Premium – Click Here To Save! During our 10-Year Anniversary Countdown, we’re celebrating more than 500 million lesson downloads, 100,000s of success stories and 10 years of helping people realize their dream of learning German with one of our biggest deals EVER! Exclusive! App for iPhone, iPad or Android: Learn German anywhere, anytime. Take your German lessons on the go with you. The Biggest Lesson Library in the World: 1,050+ German audio and video lessons by real teachers. From Absolute Beginner level to Advanced. For Existing Members! New Audio & Video Lessons EVERY Week: As an existing member, you get new audio and video lessons non-stop. Feedback from German Teachers: Have a question? Leave a comment and get feedback from our German teachers. Printable Lesson Notes & Transcripts: Get each lesson in writing with PDF lesson notes and transcripts. Read along or review after a lesson. Learning Guidance From the Pros: We guide you through the lessons. You’ll know which lessons to study and where to go next. This is THE Best Deal of 2015! Click Here to Save a Massive $127.20 on Premium! Exclusive! Custom Lists App: Create your own German word lists and take advantage of other users’ lists to master even more vocab. Motivational Progress Reports: Stay motivated and succeed with German. We track your progress so you know how much you’ve accomplished. 2,000 Must-Know Words List: All the German words you need for conversational fluency. Use this with Flashcards and the Word Bank. Smart, Memory-Boosting Flashcards: Learn German words FAST with Flashcards that improve your memory and quiz you on the hard words. Your Personal Word Bank: Your personal word list. Save new words and phrases that you learn for later review. 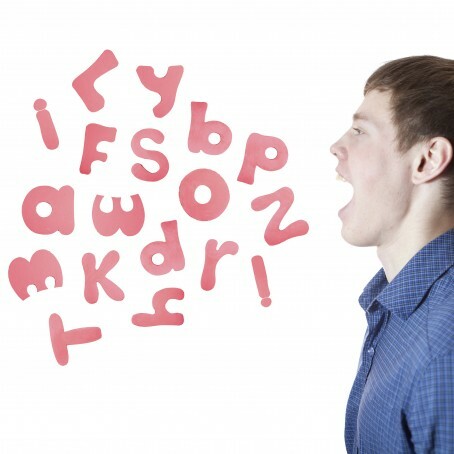 Line-By-Line Pronunciation: Hear every line from the lesson conversation again and again. Great for improving reading, speaking and listening skills. Voice Recording Tools to Perfect your Pronunciation: Record yourself and compare your German with native speakers’. Review Quizzes: Review what you’ve learned after every lesson with quizzes. Ends Tonight! Click Here to Learn German for Just $4.70/Month or $0.15/Day! Warning! This Expires At Midnight – No Exceptions! 1. All Deals End at Midnight: There will be no extensions made: Every deal during our 10-Year Anniversary ends at midnight and will NEVER be seen again! 2. All Deals Expire in 24 Hours or Less: All deals will be announced in the morning and a reminder sent in the evening, so each offer lasts for 24 hours or less. 3. Our Best Deal is NOW! That’s right: We’re starting off with our best deal FIRST during our anniversary with a BIG 53% OFF. That’s $127.20 in savings. Click Here to Get 53% OFF & Learn German with 180+ Hours of Lessons! Signing Up is Risk-free With Our 60-Day Money-Back Guarantee. Take a full 60 days to try it for yourself. If you decide later that you don’t have time to learn German or if you are dissatisfied for any reason, contact us for a full refund. Click on any link to be taken to the coupon page. Finally, click on “Complete” at the bottom of the page. You’ll receive an instant confirmation email. Start learning German with 180+ hours of German lessons! Hurry, this opportunity ends at MIDNIGHT TONIGHT! Our dedicated customer service team is standing by to answer any questions that you might have. P.S. Although we have more great deals on the way during our 10-Year Anniversary Countdown, today’s deal is your one and ONLY chance to save a whopping 53% OFF our most popular Premium plan…so don’t delay and make your dream a reality! Act now! P.P.S. A new offer starts tonight, 12AM (EST), December 8th, 2015. Take advantage right now because signing up is risk-free with our 60-day money-back guarantee! We’re Giving Thanks: German Lessons for just $2.80/Month & a FREE Video Lesson! If you ask us what we’re thankful for, it’s people like you. People who choose to learn German. People who know they will master German because it’s just a matter of time. These are the ones who truly do learn the language. How do we know? 10 years of teaching experience and feedback from learners like you. 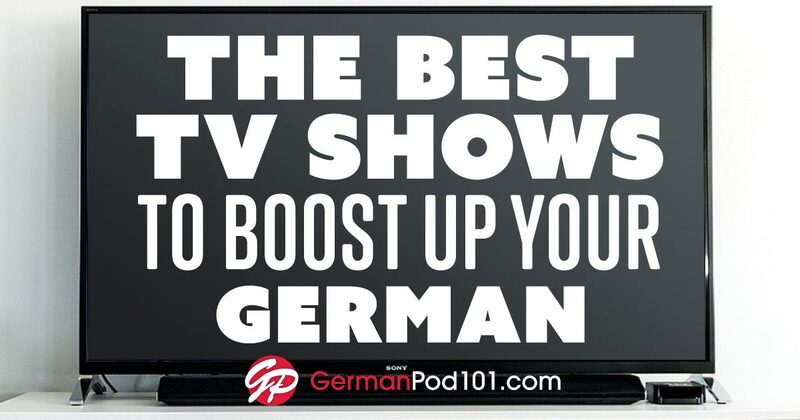 You’ve shaped GermanPod101 into a fast, effective and FUN system. Thank you. So during the Thank You Sale, Get a BIG 30% OFF All Basic and Premium Plans! Master more German for LESS with real lessons by real teachers – that’s 180+ hours of audio and video lessons. Your dream of truly learning German is a lot easier and much more affordable. But only ‘til November 25th, 2015. Click here to get 30% OFF & your free video lesson! As Low As $2.80/Month or $0.09/Day with Basic! As Low As $7.00/Month or $0.23/Day with Premium! Up to $72 in Maximum Savings! We’re giving away a free video lesson with every upgrade that’ll help you learn to say “Thank You” – in 31 different languages! Just in time for Thanksgiving. But best of all, you master German with real lessons by real teachers. Here’s how – you start speaking minutes into a lesson. Your lessons are designed around practical, everyday conversations that you master easily – from Beginner to Advanced. And our teachers guide you through step-by-step. So, with 180 hours of audio and video lessons (and counting), you get the biggest lesson library in the world. And, you can learn anytime, at your pace, via any mobile device with Internet access. Click Here to Learn German, get $72 OFF & Your Free Video Lesson! Learning Guidance: We help you start learning German so you don’t have to worry about the details. Select your learning level (Absolute Beginner to Advanced) and follow our lesson recommendations. Access To Our Lesson Library: 1,050+ German audio and video lessons, from Absolute Beginner to Advanced. Feedback from Teachers: Have a question about a lesson? Leave a comment and get feedback from our native German teachers. New Audio & Video Lessons EVERY Week: On top of the current Library, several new German lessons are published weekly. Lesson Notes For Every Lesson: Get each lesson in writing with Lesson Notes. Read along as you listen or review after a lesson. 24/7 Mobile Access: Access all lessons and notes anywhere on any device. Progress Tracking: Track your progress to see how much you’ve accomplished and know which lessons to study next. Click here to get unlimited access with Premium for just $7/month. Exclusive! App for iPhone, iPad or Android: Learn German on the go. Use our personalized learning system on your mobile device. Smart Flashcards: Learn vocabulary fast and create your own study decks. Your Personal Word Bank: Your personal word list. Save new words that you come across here to review later. Line-By-Line Pronunciation: Hear every line from the lesson conversation again and again with line-by-line breakdown. Voice Recording: Perfect your pronunciation by recording yourself and comparing your German with native speakers’. Use this with Line-by-Line. Click here to get 30% OFF any 1-, 3-, 6-, 12- or 24-month Premium plan! We’re grateful for having you learn with us. With 10 years of teaching experience and feedback from dedicated learners like you, we’ve been able to turn GermanPod101 into a fast, fun and effective learning system. And 10,000s are realizing their dream of learning German – now it’s your turn! Lock in your 30% discount today and learn German with full GermanPod101 access. That’s up to $72 in savings and as low as $1.61 per week. Your subscription is secured by our 60-day money-back guarantee! And remember, you’re getting a second BONUS gift as our way of saying thank you. Click here to learn German, get $72 in savings and a FREE video lesson! Joining is risk-free, because you get our rock-solid 60-day money-back guarantee. That’s 2 FULL months to fully experience GermanPod101. If you’re not making progress as fast as you’d like, simply contact us for a full refund! No questions asked. Choose Basic or Premium. You’ll be taken to the next page. Enter your payment information and choose the length of the subscription. Start learning German with over 180 hours of German lessons! Click here to claim your 30% discount on all plans & a free video lesson now! P.S. Take the final step to realizing your dream of learning German during our Thank You Sale and lock in your 30% instant savings – you can keep the free video lesson even if you decide to cancel and get a refund later. You have absolutely nothing to lose, so act now! Click here to get unlimited access for just $7/month or 0.23/day! 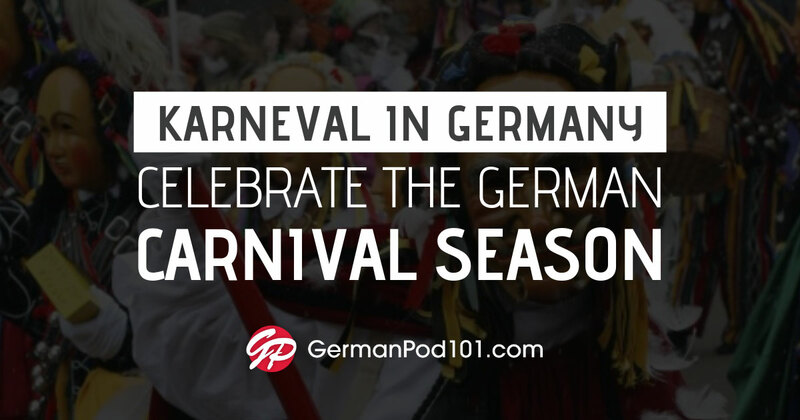 Did you know that every new GermanPod101 lesson is yours free? Fact: All new lessons are open to everyone for 3 weeks after the publish date. This is one of the major benefits of the Free Lifetime Account. Just sit back and learn. High-quality German audio and video lessons come out every week. You now get the newest lessons on your mobile device, anywhere, anytime! New update! Click here to download Innovative Language 101 for free! Users requested this. We listened. 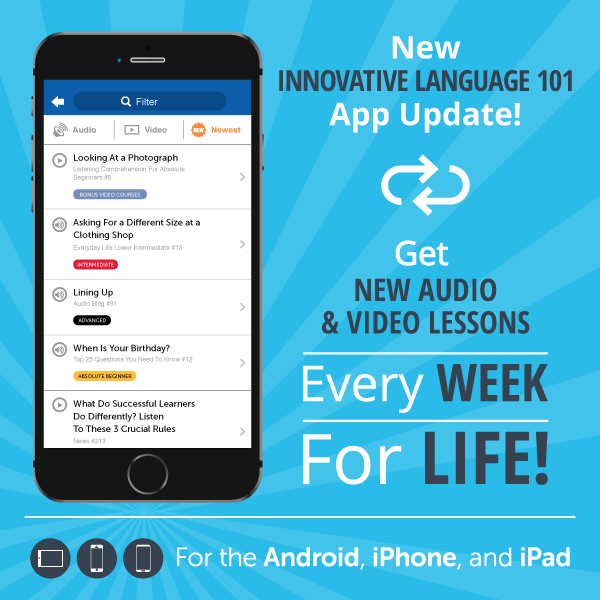 Innovative Language 101 for the iPhone, iPad and Android – the App that gives you your lessons on the go – has an awesome new update: Newest Lessons. …and you can download them to your device for extra study! When you log in to the App, simply tap on the “Newest Lessons” icon for all the latest and greatest lessons. Every time a lesson is published, you will find it here. High-quality German audio and video lessons come out every week. Remember: Every new GermanPod101 lesson is yours free. This a major benefit of the Free Lifetime Account. New lessons are open to everyone for 3 weeks after the publish date. High-quality German audio and video lessons come out every week. If you run into any bugs or issues with this new update, feel free to send us a quick email at mobileapps@innovativelanguage.com. P.S. Want to unlock the entire GermanPod101 learning system? That’s 160+ hours of lessons from Beginner to Advanced – that you can take on the go – exclusive Apps, Progress Tracking, Premium Study Tools, Feedback from Teachers and much more! Simply upgrade to Basic, Premium or Premium PLUS for more access. Click here to upgrade to Basic, Premium or Premium PLUS!